After verse 12 above, we read this from God in verse 13: ""But the people of Israel rebelled against me, and they refused to obey my laws there in the wilderness. They wouldn't obey my instructions even though obedience would have given them life. And they also violated my Sabbath days. So I threatened to pour out my fury on them, and I made plans to utterly consume them in the desert." The thing that stood out to me in this verse was "they also violated my Sabbath days." I don't get too caught up on which day of the week we take a Sabbath - as some may work weekends and have Mondays off, for example. 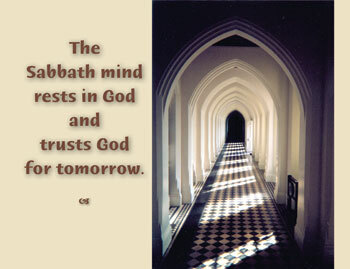 Whatever the day is for you - do you have 1 day a week that you consider a Sabbath? Why might this be a smart thing to do? A healthy thing to do? A faithful thing to do? In Ezekiel 20:40 we read: “There I will require your offerings and your choice gifts, along with all your holy sacrifices.” What are your offerings, choice gifts and holy sacrifices to the Lord? Your life, your thoughts, your finances? Do you give a percentage of your income to your local church, ministries, and nonprofits? Would this perhaps be a "holy sacrifice" if you did so? Would this be a bold act of faith? New Testament - Hebrews chapter 9 verses 27 & 28 today teaches us: "And just as it is destined that each person dies only once and after that comes judgment, so also Christ died only once as a sacrifice to take away the sins of many people." This stands in stark contrast to the old covenant where the High Priest had to atone for the people's sins over and over and over again. With faith in Jesus, our sins are forgiven all at once - for eternity - and Christ does not need to forgive us of our sins over and over and over again. Faith in Christ is the one and only thing that matters. Do you believe this? Psalms - Psalm 107 today is a wonderful Psalm of thanksgiving! Okay, be honest, who started busting out singing the Michael W. Smith worship tune "Forever" when you read verse 1? - "Give thanks to the LORD, for he is good! His faithful love endures forever." I did! That's a great tune... based on a great verse in a great Psalm. Proverbs - It is interesting to read Proverbs 27:11 as if God was writing this to each of us: "My child, how happy I will be if you turn out to be wise! Then I will be able to answer my critics." Are we spending our lives striving to be wise in God's eyes or the world's eyes? Do you think that God will be happy if you are wise? Do you want godly wisdom? Where will you find it? 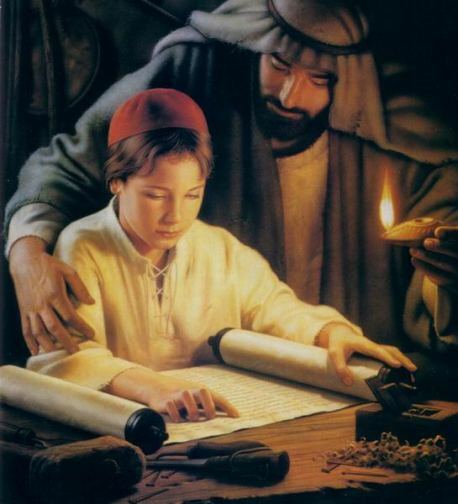 Below is an image of a young Jesus growing in wisdom with Scripture - think this made God happy? Worship God: Today's readings in Hebrews reminded me of the fantastic Jason Castro song "You Are:"
Can you sing to Jesus, "You Are the One?" Click here and sing to the One! Prayer Point: Pray that Jesus Christ is your mediator and that you have been called to receive eternal life. Pray in faith that Jesus Christ died as a ransom for your sins and that you are now living a new eternal life in Christ. These three verses and a fourth, 13, have given me food for thought and causing me to ask questions about the intent of the entire chapter. Men come to Ezekiel to seek God, and God tells them he will not tell them anything, and then states His case against them: the sins of their fathers/ancestor are being held against them. 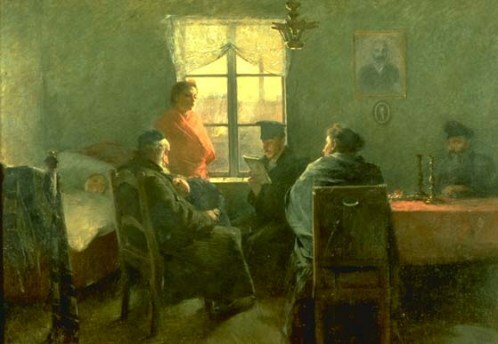 We have read in a previous chapter, Eighteen, that the soul that sins is the soul that will die (verses 4, 20). No longer will the proverb be true, that the Fathers eat sour grapes and the children’s teeth are set on edge. (Eze 18:2). So what is God up to is He contradicting His Word? What does God know about these people that He brings up a charge against them from the near and distant past? If God is not a man that He should lie (Num23:19), then it is our understanding, to be more correct, it is my understanding that is “off” and I must do some intense studying. "But the people of Israel rebelled against me, and they refused to obey my laws there in the wilderness. They wouldn't obey my instructions even though obedience would have given them life. And they also violated my Sabbath days. So I threatened to pour out my fury on them, and I made plans to utterly consume them in the desert. I don’t believe it was just the breaking of the Sabbath day that got them into trouble, it was their disobedience and rebellion against God that caused them to break the Sabbath. One could conceivable keep the Sabbath and break every other law that God made. In reading this Psalm, I realized that this is broken up into four sections. Each section describes four types of people who find themselves deep in the consequences of their sin. They may have gotten in their mess by holding different thoughts and views about life, and how to live it but they all found themselves in the same place, despair. I’m not sure if this classification is right but I will give it a try. These guys and gals are the ones trying to get away from evil society thinking if they can just get away from folk, evil sinful folk they will be alright and free from temptation. I guess maybe I see them as isolationist, running from sin into sin: the sin in their own hearts. For me the clue to the type of people mentioned here is the word “darkness.” Those without God have no light. So there are the folks who have rejected God. This group was the one I belonged to. Having been hurt by Christians and then out of my pain, hurting others, I walked in darkness bumping into every thing in site. 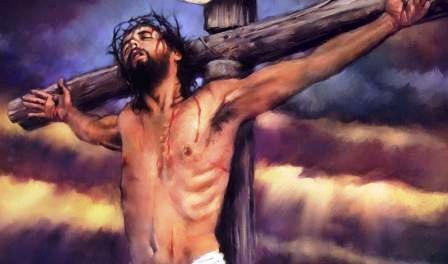 Some are fools [made ill] because of the way of their transgressions and are afflicted because of their iniquities. They loathe every kind of food, and they draw near to the gates of death. Then they cry to the Lord in their trouble, and He delivers them out of their distresses. He sends forth His word and heals them and rescues them from the pit and destruction. [II Kings 20:4, 5; Matt. 8:8.] Oh, that men would praise [and confess to] the Lord for His goodness and loving-kindness and His wonderful works to the children of men! [Heb. 13:15.] And let them sacrifice the sacrifices of thanksgiving and rehearse His deeds with shouts of joy and singing! Well this seems to be quite clear on this group, fools. The Book of Proverbs is full of descriptive adjectives and behaviors of fools. In fact in the very beginning of Proverbs, in the Amplified, we are given an understandable description of a fool. but fools despise skillful and godly Wisdom, instruction, and discipline. (1:7); And the scoffers delight in scoffing and [self-confident] fools hate knowledge? (1:22), and For the backsliding of the simple shall slay them, and the careless ease of [self-confident] fools shall destroy them. (1:32). Fools reject and despise godly wisdom, instruction, discipline and knowledge and they are carelessly self-confident. Some go down to the sea and travel over it in ships to do business in great waters; These see the works of the Lord and His wonders in the deep. 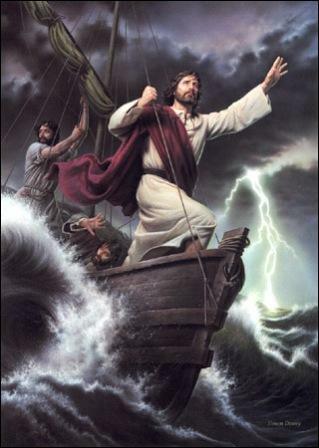 For He commands and raises up the stormy wind, which lifts up the waves of the sea. [Those aboard] mount up to the heavens, they go down again to the deeps; their courage melts away because of their plight. They reel to and fro and stagger like a drunken man and are at their wits' end [all their wisdom has come to nothing]. Then they cry to the Lord in their trouble, and He brings them out of their distresses. He hushes the storm to a calm and to a gentle whisper, so that the waves of the sea are still. [Ps. 89:9; Matt. 8:26.] Then the men are glad because of the calm, and He brings them to their desired haven. These are the folks who are always looking for and believing that the grass is always greener over there somewhere. Everything is better some where else but here. What do you see in these four groups of text? Or maybe I’ve just gone off on a tangent.